I met a little girl who was hurting. She is beautiful. She is smart. She is creative. She is joyful. She does not feel that way today. She has been hurt by other children. She has been put down, belittled and bullied. She does not understand. She has provoked no one. Can you see her? Can you feel her pain? Thus is life. Yes, we expect this in life and from the world. Now, imagine she is your daughter. Now imagine that she has be persecuted NOT by the world, nor at school, but instead she is consistently and unjustly persecuted at church. What do you do? Do you feel the utter hopelessness that comes when any child is in pain? How about if it is your child? Do you feel it? That almost instantaneous feeling that may overcome you to seek justice. To protect and shelter. To become the viscous mother bear. Then, you pray, you reel in the flesh. You stop. Those earlier mentioned responses are all natural responses, but that is not what Christ demands of us. He commands those things which do not come naturally to human beings. We are to choose the higher way. We are called to love, to forgive, to teach. Titus 2 even commands us to teach not only our children, but all those younger within the faith. 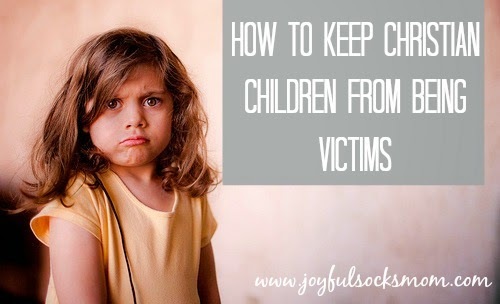 How are you then to proceed in keeping your own child from adopting the "victim" spirit? "Forgiveness is a repeated action, not only to repeated offenses, but also to repeated remembrances of past hurt and pain." Look to God's Word for the answer! God's Word is the source for every other suggestion I am about to make. Let His Word lead you in teaching and helping your child. Pray with them, teaching them to pray for those who persecute them. This is simple, it is just not easy. Teach your child to do the hard thing. Help children to see clearly and evaluate their own behaviors, praying with them to be certain that they have no fault in the relationships they are struggling in. Correct them in their wrong, if any, and help them to realize though that bullying is still, not ever, a justifiable action no matter their own wrong. Teach them about forgiveness. We are human, therefore we forgive, but we DO NOT forget. Forgiveness is a repeated action, not only to repeated offenses, but also to repeated remembrances of past hurt and pain. Discuss healthy boundaries. Children need to be taught what a "real friend" looks like. They need to be encouraged to be a friend, and seek friends that are trustworthy and loyal. Still, we must help them to remember that we are called to love those who are our enemies. Children need to understand that they cannot control these situations, but that they must learn to control how they respond to these situations. Help them see that they are not above their Master, that Christ was persecuted, therefore we may be sure that we will be as well. "My brethren, count it exceeding joy, when ye fall into divers temptations, Knowing that the trying of your faith bringeth forth patience, And let patience have her perfect work, that ye may be perfect and entire, lacking nothing. If any of you lack wisdom, let him ask of God, which giveth to all men liberally, and reproacheth no man, and it shall be given him. But let him ask in faith, and waver not: for he that wavereth, is like a wave of the sea, tossed of the wind, and carried away. Neither let that man think that he shall receive anything of the Lord. A double minded man is unstable in all his ways." Teach your child that they are responsible for helping and teaching younger children. I have seen problems with the way that even Christian children, treat younger children. We need to teach our own children to take seriously the responsibility of teaching those younger, and weaker, than they. We must help them to focus on striving to help those who look up to them, although they are young them selves, and not look down on others because of their age. If all parents would be dedicated to this, much of the bullying mentality inside the Church would soon vanish. Spend time with your kids reading, praying and studying Titus 2. In the end, it is a lesson. A test. A trust. God trusts the child with the test. He has given them enough grace to endure. God trusts us to lead our children in the way they should go. The way of love. They way of forgiveness. 5 Writing Activities For Creative Fun! Help Your Kids to Eat Up Their History!